Having a barbecue area is a must for the summer months more so for people who love entertaining at home. However, just a grill and a patio will not cut it for those who plan on throwing amazing outdoor parties. An outdoor kitchen is a must-have for a luxury home and not just for the looks but as a wise investment as well. Go for the best finishes to give your outdoor kitchen a touch of opulence. A marvelous freestanding bathtub can’t be discounted when you want a truly luxurious bathroom. For an elegant look, choose a classic white bathtub against a calm and serene background. Some models have jets and whirlpool features built in and the look can range from turn of the century to modern designs. 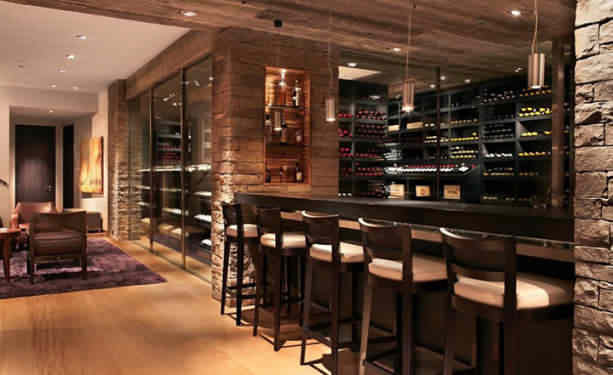 You can have a run of the mill indoor bar but that is nothing special compared to having your own wine cellar to showcase your wine collection. It won’t really be splurging since the benefits outweigh the cost of building one. This way, you can be sure that you won’t run out of your favorite wines and that they’re kept in the best condition possible for your enjoyment. A home theatre is still a favorite luxury home feature for those who live a plush life. You can have it designed in such a way that it doubles as a game room or an entertainment den for your family. A fridge and a small sink are a must for refreshments. Don’t forget the awesome sound system too! Only a few luxury home upgrades can beat having your own indoor pool. However, if you think about it, an indoor pool is a great investment not just for your home but for your health and quality of life as well. Having an indoor pool means that you can swim whenever you want, no matter the season and the time of day. If you have space, then you definitely should build a sports court for your favorite sports. Imagine hosting your own tournament amongst friends or not having to leave home to play a few matches. Talk about the ultimate in convenience! Whether you love cooking or not, having a state of the art kitchen that’s perfect for a chef will make entertaining at home so much better. Imagine how convenient it will be when you hire a professional chef for your parties or when you have the best of everything to prepare delicious meals for your family in your luxury kitchen. Don’t forget that the kitchen is often a huge deciding factor when selling or buying a home! This is one of the best luxury home upgrades in terms of return of investment. Do you want to know the most sought-after features in modern luxury homes? Then have a look at what we have to offer in our available Oakville luxury homes! Contact us if you’re looking for a new home in Oakville!